JACKSON-Samantha Conners (Badge #300), age 23, was sworn in by the Township Clerk and appointed as our newest police officer with the Jackson Police Department today. She has attended Franklin Pierce University and Iona College, earning a degree in psychology and previously worked for MONOC. She will be attending the Ocean County Police Academy and upon graduation will be assigned to a field training officer for additional training before being assigned to a patrol squad for solo patrol. 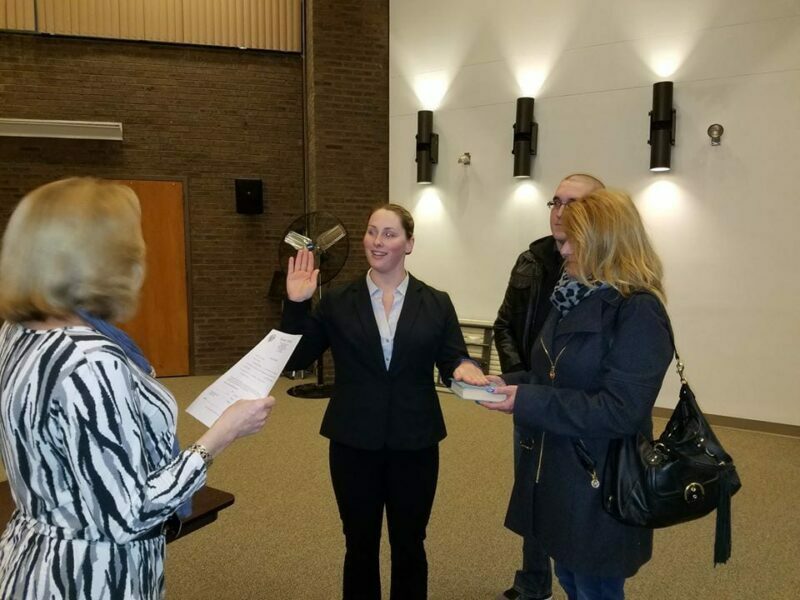 We congratulate her as she begins her career as a police officer with the Jackson Police Department and would also again like to thank the Mayor, Town Council and Administration for their continued support of the department as the agency grows to serve the growing township. Including the newly hired officers, the department will be staffed with 91 fully sworn police officers to serve the 100 square mile township and its approximate 60,000 residents. With these newest hires, the agency, whose officers are responding to an increasing variety and volume in calls for service as the town and the areas around us continue to grow, is nearing its highest staffing level that it last had in 2008. As always, we would also like to thank the town’s residents for their support of the agency and our officers.